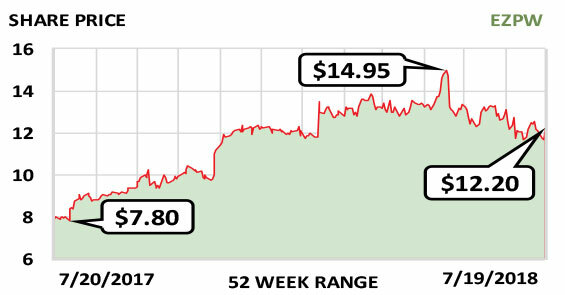 This week’s Stock of the Week is in a stable business and expanding its offerings and geographical footprint. EZCorp Inc. (EZPW) operates more than 500 pawn shops in the US—a stable market for the company—and has an increasing presence in the faster-growing Latin American market. It now has 339 pawn shops in Mexico, 73 in Guatemala, and others in El Salvador, Honduras and Peru. EZCorp is in the middle of refocusing on its core business after an ill-advised expansion beyond pawn shops led it to make some investments in Mexico that it later had to sell off. It is now growing both organically and through acquisitions of mom-and-pop–style pawn operations. Management knows the pawn business well and operates very efficiently. Its plan for Latin America is to move stores there into items beyond jewelry, which has traditionally been the focus. This means handling general merchandise such as TVs, video games and power tools, which are already common in US pawn shops. Although Latin America is a less stable region politically than the US, EZCorp’s carefully considered strategy positions it well for the future. Revenue was $748 million in fiscal 2017 and will likely grow to $809 million in fiscal 2018 and $834 million in fiscal 2019. Fiscal year: September. Earnings per share: 2019 est./$0.96…2018 est./$0.81…2017/$0.59.